The prompt for this project was a thought provoking one from the start! I wanted to do something that would allow me to go beyond what a simple picture of myself could tell – or rather, I wanted to say much more in one frame than a single picture would normally be able to, thus the projected collage. The shadows on my face are meant to keep the viewer from focusing too much on my “physical self” and instead pay attention to all the images, which tell you much more about who I am. I must note that only a handful of the pictures are my own, so I’m providing the links where I found all of the others below. Aaron: I think this is a creative and interesting approach and it does allow the viewer to peer deeper into your life and the things that make you who you are. However, I almost feel like you’re lost in the image – perhaps on purpose? I didn’t realize you were in there until I looked more carefully, and it’s difficult to interpret your pose. I wonder what it would look like if you projected this so it mostly fit on your face and then took a traditional portrait? Amanda: It’s interesting to read Aaron’s critique on your piece, because I personally loved that your sense of “self” is lost in the image. I think the photo does an extremely successful job of removing who you are as an individual & conveying that you can’t be defined by just one thing. I want to commend you on capturing the projections on your face – it’s a phenomenal image as a final product, but I can image it was difficult to toggle with the lighting, the strength, capturing the images sharply, etc. To make this photograph even more powerful, I think it could benefit from selecting many many more thus making a “tiled” texture across your body – that would emphasize the feeling of being lost in the images. I know there are obvious limitations to what you can shoot, but if you had months to work on this, it would have been very cool to see all of the background be compiled of shots you took – each with a special meaning & signfigance (as opposed to stock photos). Ultimately, really love the concept & the compilation of different technologies! Jacquelyn: Through your collage, I’ve gained greater insight into you as an entire person. Unlike the other projects, you chose a very unique way to your interests, hobbies, and personality. At first, I only saw a compilation of various photos and your self-portrait in the top right corner. After taking a few steps back, I saw your silhouette and your arm reaching towards the camera in your self-portrait. I’m not sure which tools you used to do this, but it’s definitely very creative and artsy! Not only do viewers get a face-to-face portrait of you, but a side-portrait as well! Khatiti: I love the collage, and how it shows things about your hobbies and the things you enjoy. It took me a while to realize that you were in the photo, and this supports your goal of showing important, non-physical traits at the forefront. I agree that this was a super interesting and artsy approach to the self-portrait and it was definitely well executed! Mary: I initially was unsure what I was looking at. 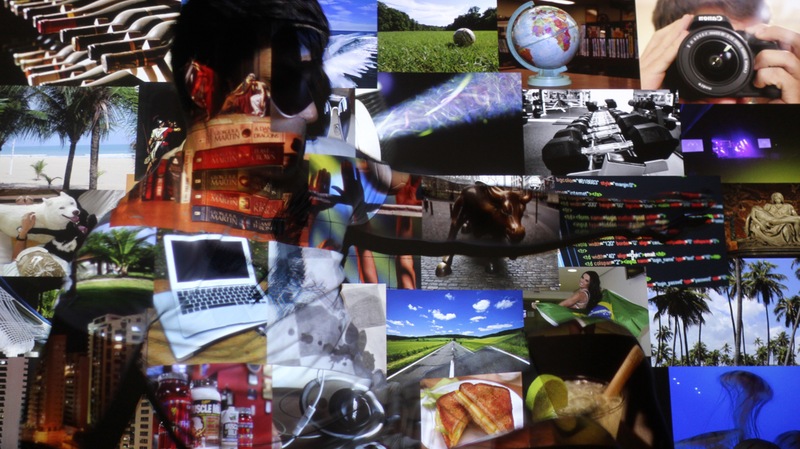 I didn’t see that these were images projected onto you, rather than a collage of images. After spending some time thinking about this, I’m unsure of how I feel about this picture. I think the technique is really interesting, and I think that it was a great experiment, but I feel a little confused about it. I’m under the impression from your artist statement, that these are photos of things that you love, or things that represent you. The projection of the images onto you makes me feel like these are things that society or some oustide force is putting on you, on your surface, rather than being things that comprise you. I think it was a very different method for including these different aspects of you into the photo, but I found it confusing. Posted in #2 - Self Portrait, FernandoTagged collaborative, collage, digital photography, fernando, hotography, photographer, project 2, self portrait, selfie, the photograph collectiveBookmark the permalink.